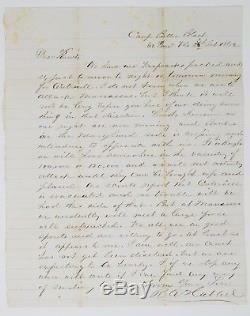 Offered here is a fascinating Civil War soldier letter written by Corporal Robert H. Hubbel of Company K, 14th New York Volunteers. The letter recounts his regiment's slow February 1862 advance on Centreville and Manassas , Virginia, a movement brought on by President Lincoln's General War Order No. 1, which called for a general advance of Union forces by February 22, George Washington's birthday. Hubbel indicated his letter was written from the camp of another regiment in his brigade, the 62nd Pennsylvania Volunteers. Camp Bettie Black was named for the wife of the 62nd's Colonel Samuel W. 62 Penn Vols 28th Feb 1862. We have our knapsacks packed and expect to move to night or tomorrow morning for Centreville. I do not know when we are to attack Manassas, but I think it will not be long before you hear of our doing some thing in that direction. Smith's Division on our right are now moving and General Nathaniel P. Banks on the Maryland side is crossing and intending to operate with us. It is thought we will have some where in the vicinity of 100,000 or 120,000 and we will not certainly attack until they can be brought up and placed. Our scouts report that Centreville is evacuated and no trouble will be had this side of that. But at Manassas we undoubtedly will meet a large force well entrenched. We all are in good spirits and are willing to go. At least so it appears to me. Our camp has not yet been dissolved, but we are expecting to be hourly. I, if we stop any where, will write if I can find any way of sending to you. 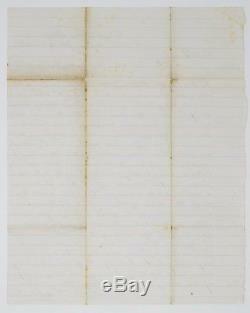 The letter is written on one side of a 7 3/4" x 9 3/4" stationery sheet (front sheet removed from standard bifolium at left margin). The paper is in excellent, sturdy condition, not stiff, and not particularly delicate. There are several creases at the locations of original folds, with a couple of very small voids where those creases meet. Very little wear to edges and corners. Please see my other items for more interesting Civil War letters, documents, and images, including other items related to this same soldier. The item "Feb 1862 Civil War Letter 14th New York Moves Toward Centreville & Manassas" is in sale since Thursday, July 26, 2018. This item is in the category "Collectibles\Militaria\Civil War (1861-65)\Original Period Items\Correspondence, Mail". The seller is "iron-horse-sales" and is located in Champaign, Illinois. This item can be shipped to United States, Canada, United Kingdom, Denmark, Romania, Slovakia, Bulgaria, Czech republic, Finland, Hungary, Latvia, Lithuania, Malta, Estonia, Australia, Greece, Portugal, Cyprus, Slovenia, Japan, China, Sweden, South Korea, Indonesia, Taiwan, Thailand, Belgium, France, Hong Kong, Ireland, Netherlands, Poland, Spain, Italy, Germany, Austria, Israel, Mexico, New Zealand, Philippines, Singapore, Switzerland, Norway, Saudi arabia, Ukraine, United arab emirates, Qatar, Kuwait, Bahrain, Croatia, Malaysia, Chile, Colombia, Costa rica, Panama, Trinidad and tobago, Guatemala, Honduras, Jamaica.